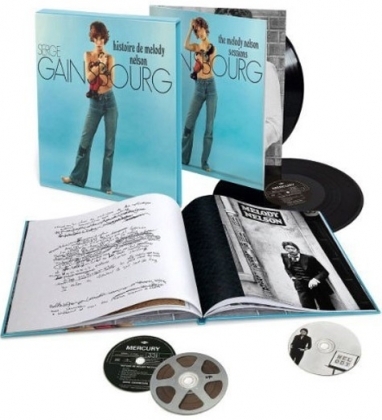 Serge Gainsbourg’s groundbreaking concept album is released in deluxe and super deluxe editions with considerable new and unreleased material. Originally released in March 1971 this concept album, Histoire De Melody Nelson, from the iconic French songwriter Serge Gainsbourg is a delicate and modern masterpiece of orchestral pop. Created as an adult tale, each of the seven tracks tells the story of a teenage English girl named Melody Nelson (sung by Jane Birkin) who meets a forty year old French man (sung by Serge Gainsbourg). Histoire de Melody Nelson is considered by many critics and fans to be Gainsbourg's most influential and accomplished album. Its unique blend of guitar, psychedelic pop, funk, bass and near spoken word vocals was framed by Jean-Claude Vannier’s lush orchestral and choral arrangements. Vannier, once dubbed the French George Martin, composed most of the music for the album in collaboration with Gainsbourg where each track is more like a movement of the music than just a simple song. In addition to the remastered original album a second disc/LP features previously unreleased alternative vocal takes and instrumentals. After the release of the album, a music video was filmed for each song, released together as a short musical. These films feature in a new documentary included on the DVD disc. The documentary uses French National TV (INA) Archives and has exclusive interviews with Jane Birkin, Jean-Claude Vannier, Jean-Claude Charvier (sound engineer of the album) and Tony Frank (photographer of the front cover of the album). The DVD disc also includes a 5.1 version of the original album. In October 2006, Jean Claude Vannier performed the album live in its entirety at London's Barbican with guest vocalists Jarvis Cocker, Badly Drawn Boy, Brigitte Fontaine, Mick Harvey of The Bad Seeds’ and Gruff Rhys from Super Furry Animals. Vannier has since performed the album with an alternative cast in Paris and, in August this year, at the Hollywood Bowl as part of a tribute to Serge Gaisnbourg, guests that evening included Beck and Sean Lennon.